ENDURA Cr is developed for severe wear and impact applications applying specially formulated abrasive materials on AR 450 backing plate. The overlay material is composed of primary chromium-rich carbides and refined multiple-alloy complex carbides dispersed evenly in a ductile eutectic austenite matrix. 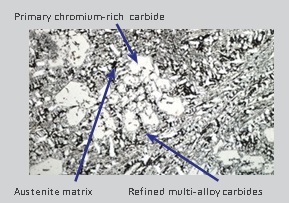 The additional multi-alloy carbides are harder and finer than the co-existing chromium-rich carbides which interlock between large primary chromium-rich carbides in a matrix. Good performance for impact situations at elevated temperatures up to 350° C (660° F), best impact resistance is at room temperature. The microstructure of ENDURA Cr contains primary chromium-rich carbides and refined multiple-alloy complex carbides with a typical hardness of 2500 to 3000 HK4) dispersed evenly in a ductile eutectic austenite matrix. The typical volume fraction of primary chromium-rich carbides is maintained between 30 to 40% with 7 to 10% of multi-alloy complex carbides. * Surface hardness is measured on machined flat surface just below overlay surface. * ASTM G65 is a standard test measuring sliding abrasion resistance using a dry sand / rubber wheel apparatus. ASTM G65 – Procedure A is the most severe test method. ** ASTM G65 wear test is conducted at 75% depth of the overlay materials to ensure consistently good wear resistance from top surface through to the depth of 75% of the overlay. 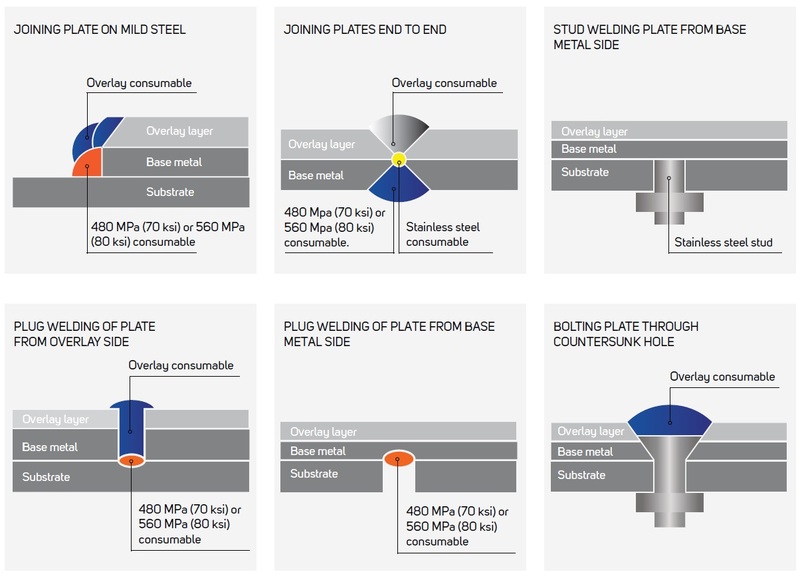 Plate flatness tolerance can be guaranteed within ±3 mm (±1/8”) over 1.5 m (5’) plate length for plate dimensions equal to or less than 1.5 m (5’) x 3.0 m (10’). For plates greater than 1.5 m (5’) wide by 3.0 m (10’) long, the following flatness guarantees apply. 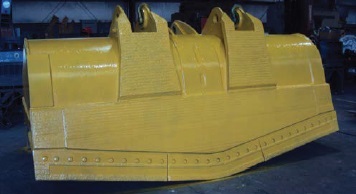 overlay plate or wear parts onto your equipment. When joining base metal use 480 MPa (70 ksi) or 560 MPa (80 ksi) consumables. Any surface exposed to severe wear should be protected with hard-surfacing consumables. ENDURA Cr can be cut by plasma, laser, water jet, arc gouge, and abrasive saw cutting. 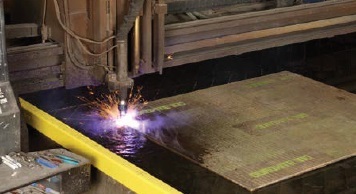 It cannot be cut by oxy-fuel flame cutting. ENDURA Cr should be cut from the base metal side only to avoid carbon contamination. 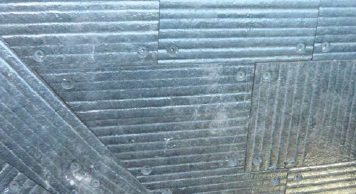 When beveling, ENDURA Cr overlay plate can be burned from the hard side. Cutting speeds need to be reduced when cutting carbides. ENDURA Cr is typically formed with overlay to the inside but can be roll formed with overlay to the outside. Avoid bending plate parallel to the welding bead direction. The staggered cracking pattern on the overlay surface ensures good formability when bending. For bending radius recommendations, see chart below. Machining ENDURA Cr with onventional methods is not recommended. It can be finished by grinding. Countersunk holes can be precisely produced by EDM (Electrical Discharge Machining). Pre-machined mild steel inserts can be used if extra machining is required.